The Hollywood action movie has been in a poor state in recent decades, with a lack of filmmakers capable of conveying on screen action in a manner that's sufficiently thrilling, or even easy to follow. Directors with a single indie drama on their CV are hired to helm franchise entries, and all too often make up for their lack of interest in creating well choreographed set-pieces through the use of shaky camerawork and rapid cuts, the idea being that if the viewer can't follow the action they'll presume it's because it's so kinetic. Eschewing such nonsense, 2014's John Wick was a breath of fresh air for action movie fans. Directors Chad Stehelski and David Leitch (only the former returns here) delivered a beat-em-shoot-em-smash-em-up shot like a Vincente Minnelli musical, with their leading man, Keanu Reeves, filmed in full body shots with a minimum of editing. Stehelski, Leitch and Reeves had put in the work for months before arriving on set, turning the latter into a convincing killing machine. We would never look at Reeves in the same way again. 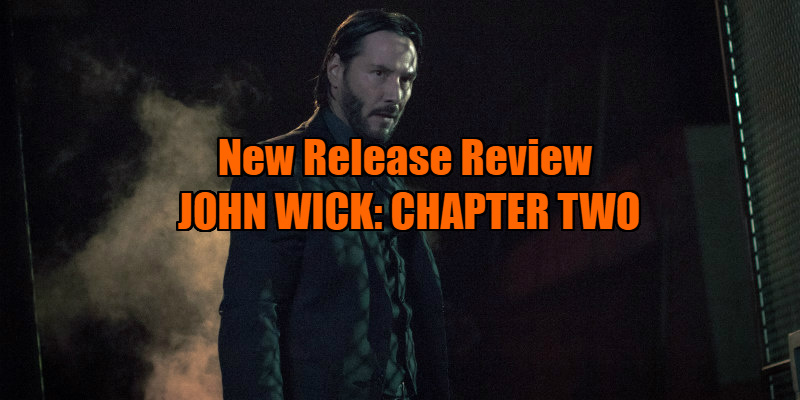 The effort paid off, with John Wick turning a healthy profit on a modest $20 million budget, and so the inevitable sequel arrives with a boosted budget that's all on the screen. Wick having avenged the death of his dog in the first movie, John Wick: Chapter Two opens with the titular teflon terror retrieving his stolen car from Peter Stormare's Russian mobster, leaving a trail of bodies and bent fenders behind him before heading home to his new dog ("Does he have a name?" "No!") and planning a violence free life. But just when you think you're out, they pull you back in, and Wick finds himself forced to complete one last job if he's to retire in peace. The movie splits itself into two halves from this point, with the first taking place in Rome, as the bearded babayaga attempts to assassinate female Mafiosa Gianna. In a refreshing change, the flirtatious and provocative Gianna is played by an actress (Claudia Gerini) of the same vintage as her leading man. With Wick prowling through primary coloured caverns like Jessica Harper investigating the ballet school of Dario Argento's Suspiria, and a cameo by spaghetti western legend Franco Nero, the film wears its Italian genre influences on its immaculately tailored sleeve. The first movie's incessant action grew tiresome by its climax, so thankfully its sequel is more evenly paced, with much of the first half devoted to developing its hyper-stylised environment and fetishing the tropes of the action genre. Much time is devoted to the classic action staple of our hero getting 'suited up' before he sets off on his mission, with Wick visiting a suave sommelier (Peter Serafinowicz) who doubles as a gun salesman, and a tailor who outfits him with suits specially designed for 'tactical' use. When Wick returns to his home turf of New York, the movie turns into a glorious love letter to Walter Hill, signed with a bloody thumbprint (look out for a quick cameo by Hill stalwart David Patrick Kelly). With a $7 million bounty setting every hitman and hitwoman in New York after Wick, the film's back half plays like a riff on The Warriors, with its hero facing off against a variety of distinctive would be assassins. An extended duel between Wick and a cool as ice hitman played by rapper Common in the NY subway is a highlight not just of this film, but of the modern action genre in general, mixing ballistics with ballet. The graffiti of Hill's bankruptcy era New York may have been replaced by post-Guiliani neon billboards, and the subway cars may be spotless, but that just makes them all the better to smear blood on. Much of the action of this sequel takes place in art galleries, and the film is something of an art installation itself. Accusations of style over substance will no doubt greet its release, but here the style is the substance; this is action as arthouse movie. Often resembling a boutique men's magazine come to life, John Wick: Chapter Two puts a metrosexual spin on a macho genre. All it lacks is an 'Aftershave by...' credit. 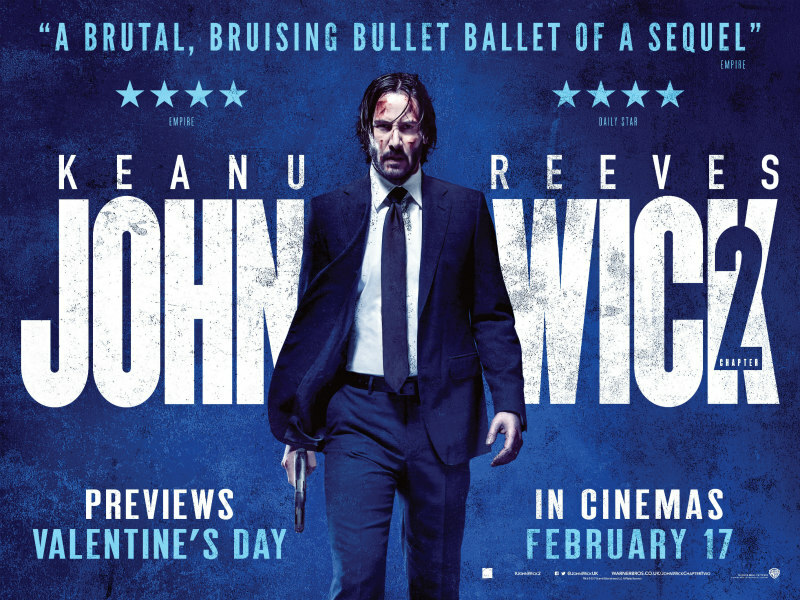 John Wick: Chapter Two is in UK/ROI cinemas February 17th with previews on the 14th.